Amazingly I have now been on holidays for two weeks and am only now getting around to posting a recipe! Time has just been flying by with lots of cooking, beach walks, running, picking citrus, playing with the chookies and exploring the beautiful south west where my parents live. So here I am with a new recipe that is quick enough to be whipped up by all of you on holidays as well as those who are not so lucky. Lately I have been feeling a little tropical and craving asian inspired food, even though on average its only been about 12 degrees! 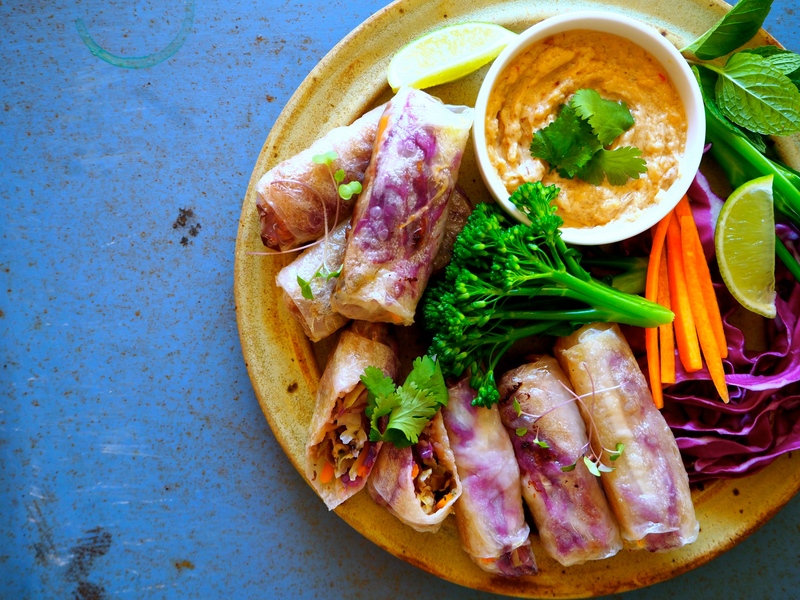 Think fruity smoothies with lime and coconut, fresh herb salads, fried brown rice, gado gado and these spring rolls. The fabulous thing about these is that they are baked not fried, which creates a much healthier snack without compromising on flavour or texture. The outside doesn’t achieve the same colouring but it is still crisp to the bite and the filling remains beautifully steamed inside. We enjoyed these for lunch along with the suggested add ins and all three of us were completely satisfied. Feel free to get creative with the filling and add in other asian vegetables depending with what you have available. Fresh capsicum and thai basil would be great additions. To make the mushroom filling, heat the sesame oil in a large frypan then add the spring onions, garlic and ginger and stir fry for a couple of minutes or until fragrant and beginning to colour. Add the mushrooms and chilli and continue to stir fry for 5 minutes. Then add the tofu, half the cabbage, the coriander and continuing to cook for another 5 minutes. Stir through the tamari and set aside. Preheat the oven to 200 degrees celsius. Prepare a bowl with lukewarm water to dip the rice paper sheets in, place a damp tea towel on your work surface and line a large baking tray with baking paper. 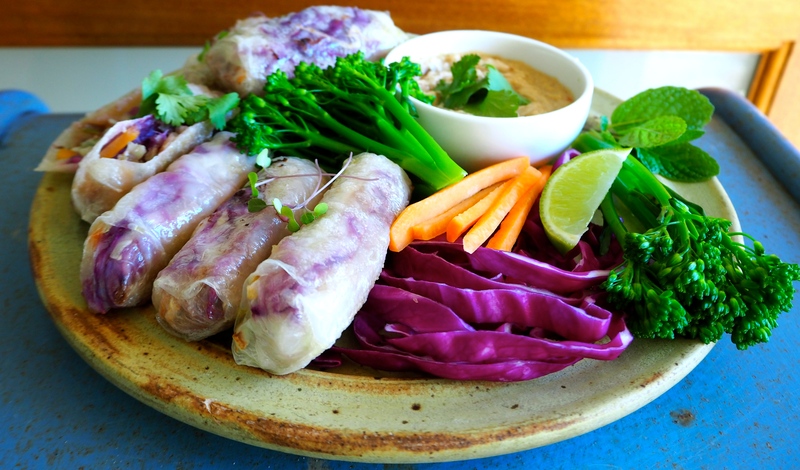 When the mushroom mixture is ready, soak the rice paper for 30 seconds then place on the damp tea towel and load up with the mushroom filling, noodles, carrot and both types of cabbage. Roll up from the end closes to you folding the sides in as you go, (follow directions on rice paper packet). Place on the prepared tray and continue until all the filling is used. Brush the prepared rolls with the EVOO and place in the preheat oven for 15 minutes. Turn and cook for another 10-15 minutes. Serve immediately withe the suggested sauces and vegetables. Simply combine all the ingredients in a small bowl and whisk to combine. Add in 1-2 tbsp just built water to thin to your desired consistency. Enjoy, and hopefully I can transform those of you suffering in the winter chill to a sunnier place with these flavours. 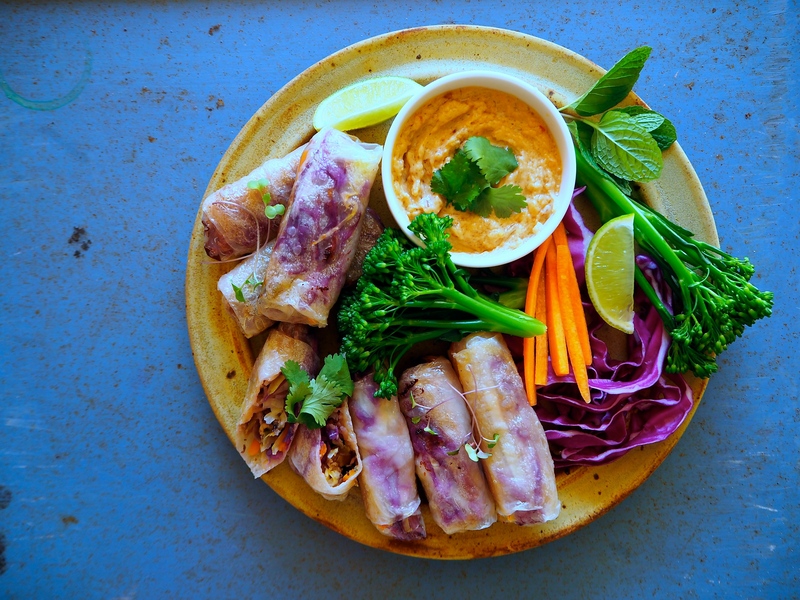 I think hands down these are the prettiest spring rolls i’ve ever seen! HOpe things warm up for you!